1. What is BogoArt and the impact on Youth, Peace and Security? The BogotArt Foundation is a youth-led organization born with the purpose of fostering social integration, meeting spaces of diverse groups and creative exercises as a way of understanding one another. At a local level, we work in peripheral areas of Bogotá where through the co-creation of artistic expressions such as murals, photography, and videos, communities can portray themselves from a different angle and thus create their own narrative, often times challenging long-held stereotypes towards them. As well, it is a way to attract other members of society to visit this area and start to create a network of unlikely subjects. Similarly, at a national level, we started the campaign Letters for Reconciliation, a youth-led initiative to foster reconciliation, where ex-combatants and citizens exchanged letters to got to know each other better, have a different perspective of the conflict and create an understanding of 'the other' that can humanize that person, removing levels and promoting a connection at a deeper level. This project was carried out in collaboration with the JCI and Fundación Jóvenes para Jóvenes. Like this one, there are several other projects happening all over the territory. The important thing for us to realize is that youth are playing a relevant role in promoting a culture of nonviolence and creating the conditions for the new generation to the first one to live in a country in peace. 2. What are the key challenges of implementing the peace agreement in Colombia? At the moment, the main challenge to fully implement the peace agreement is the current administration. We recently had a transition of government and the new administration has several disagreements regarding the peace agreement, to the point that it is still uncertain whether Colombia's Special Jurisdiction for Peace (JEP acronym in Spanish) will be implemented, one of the fundamental pillars of transitional justice in the country. This legal uncertainty reduces the confidence of the citizens, ex-combatants and the military in the country's institutions, thus difficulting a real transition to a stable situation and can be a factor that increases the skepticism of the former rebel group to transition to a new chapter in civil life. Another important challenge that we face is the one concerning the assassination of social leaders. Organizations such as Indepaz have reported 566 leaders from January 2016 until January this year. One preoccupying factor is the declaration by America's Director of Amnesty International, Erika Guevara, who stated that during Duque's government, addressing the murder of social leaders is not a priority. Just recently, the state prosecutor recognized that there is a pattern behind these killings, yet the impunity rate of the authors of the crimes is 95%, showing us how little is done. The government strategy to address this problem has been the Action Plan for Timely Prevention and Protection of Human Rights Defenders, Social Leaders, and Journalist (PAO acronym in Spanish). However, some of the members of this body, such as the general Leonardo Alfonso Barrero Gordillo, have been involved with the 'false positives' scandal and thus, the citizens who are to be protected, feel re-victimized. Another point is that the overall strategy is mainly based on a military strategy and not on an integral approach, that generates real state presence in the territories and starts to address the root causes of inequality. Quite connected is the lack of meaningful action. In 80% of the social leaders' homicides, the Ombudsman Office had already informed of the risk with early warnings, yet there was no effective response of the government. This type of negligence is costing lives. One social leader dead is one too many. A government that does not protect the lives of its citizens is a government that is a threat to establishing sustainable peace. A similar situation of being ignored by the government is what is currently happening with the Minga Nacional por la Vida (National Minga for Life in English). The Minga is a national indigenous and countrymen march that started on the10th of March this year, bringing together the communities of the departments of Valle, Cauca, and Nariño, three of the most affected by the war. They are advocating dialogue with the government, inviting the president to engage in a conversation with the indigenous communities to be accountable and comply with previous agreements to address their main needs and help to establish a sustainable peace, yet after almost one month blocking the Panamerican highway in the southwestern part of the country, President Duque has not shown any willingness of conversation. Finally, any discourse should be reflected with actions to have political coherence. That is not being demonstrated by the current administration. While President Duque talked at the 2018 UN General Assembly about "peace as a goal of all of us as Colombians" as well as "we (the government) will work so all the regions of the country, especially those most affected by war, will receive the resources and investments that generate hope", this does not hold up in reality. The current National Development Plan does not include a specific chapter dedicated to peace, which is mandated by the Constitutional Court, where they mentioned that regardless of who is the president, there should be an ongoing investment on peace derived from what was agreed on the peace accord. Contrary to its speech, the government is not including the most affected war regions as an investment priority and taking into account all the allocated budget, it only covers 29% of the required investment on peace, according to Congresswoman Juanita Gobertus. 3. How could we, as the youth, encourage the implementation of National Action Plan on Resolutions 2250? First of all, we, the youth, need to realize that we are a powerful actor in the area of peace. We are the ones who are going to face the consequences of any peace policy decided right now and it would affect us for the rest of our lives. We should also think of peace not only as the cessation of the violent conflict but as well as an approach all the structural inequalities in society and generate the conditions so, any newborn, regardless of the family and socioeconomic background where s/he is born, can fully develop all its potential and thrive in a society where s/he can contribute his/her skills for the community improvement. Under this vision, when we think about the implementation of the National Action Plan on Resolutions 2250 & 2419, we are not only talking about solving an immediate consequence of the conflict but rather tackling its root causes and hence generating a panorama that is hopeful and provides the new generation with a set of skills to effectively embrace the Fourth Industrial Revolution and be agents of change and sustainability in their communities. By acknowledging this opportunity, we can come together as youth, building coalitions that truly represent our diversity and through these spaces, we can generate a channel of communication with the government, where dialogue would be the key mediator to define a common future and meaningful agenda that guarantees peace, not only for those on planet earth right now but for the generations to come. 4. 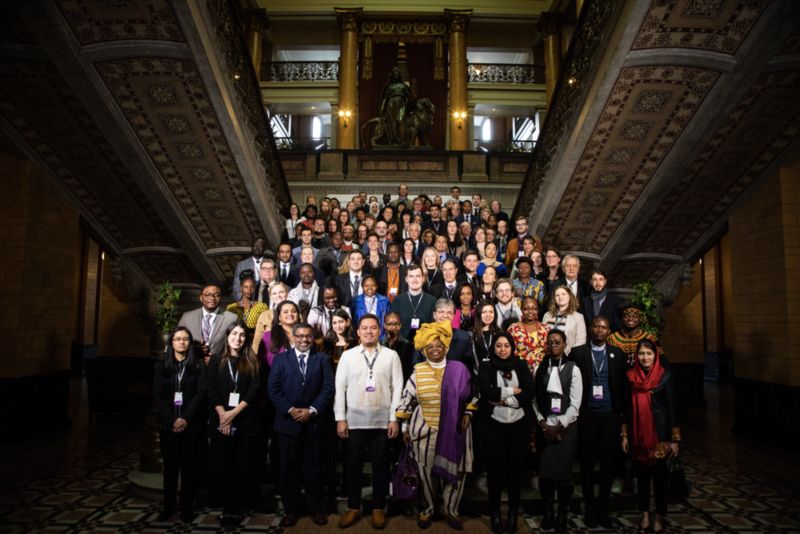 What is the Youth Peacebuilders Forum 2019 and how can youth participate? The Youth Peacebuilders Forum 2019 is an event bringing together young peacebuilders from all over the world to exchange best practices, ideas of collaboration and develop projects together. This is the first time ever that the event is held in the Americas and the theme is Leaving No Youth Behind Through Agenda 2250 and 2030 really highlights to of the priorities of the youth right now: Becoming partners in peacebuilding and as well the architects of a sustainable world. Bringing the event to Colombia right now is very timely because, in the 1st International Symposium on Youth Participation in Peace Processes, the Colombian Government committed to establishing a National Action Plan (NAP) on resolutions 2250 and 2419, becoming a pioneer in the area. The forum will be a follow up of this commitment, to know how much progress has been done and, at the same time, motivate youth from all over the world to work together with their governments to create their own NAPs. The call for participants will be launch very soon and it will be a space that ensures regional and gender diversity, and also includes a wide array of experiences of youth participating in peace processes. 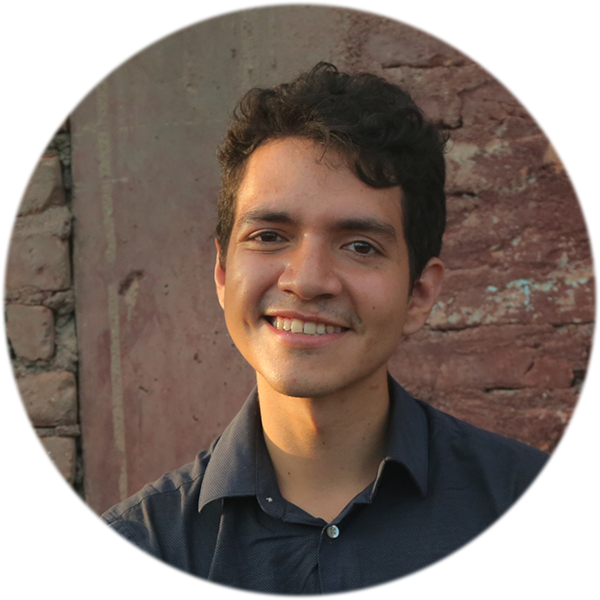 Leonardo Párraga is a global citizen acting in a local context. He believes that peace, development, and happiness in society start at a personal level, that is why he is in a constant process of self-actualization. He is passionate about the arts, community empowerment, and life-long learning. With diverse studies including business management, journalism, and social entrepreneurship, he combines the knowledge of diverse areas to achieve disruptive results. He founded the BogotArt Foundation in 2013, a youth-led organization aiming to generate social inclusion, foster creativity and promote peace through the use of the arts and culture. In 2017 he co-founded the campaign Letters for Reconciliation, which brought together more than 3,000 people, generating a dialogue between FARC ex-combatants and people from the cities, in order to reduce stereotypes and mutual hatred, transforming “the enemy” into someone one can relate to. He loves writing poetry, taking pictures and traveling.